We live in a world of fast moving innovation and change so it's no surprise that the traditional Golf Club membership model is under pressure. Players want more variety and freedom of choice and less restrictive commitments such as annual membership contracts to just one club when they can have access to multiple facilities. Collingtree Park have been very innovative by offering paid up members access to a Network of reciprocal golf clubs to give their members the variety they are looking for. Other organisations like Whole in 1 Golf and golf societies are also gaining traction, golf clubs that embrace this concept can really stand to profit. We have formed a relationship with Collingtree Park Golf club to offer a trophy service to all their corporate and society days enabling the club to earn a commission for every order placed. 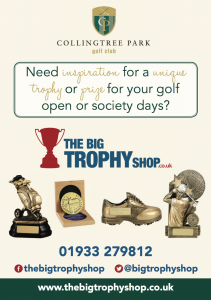 We have provided Collingtree Park Golf Club with a co-branded webpage where their clients can order personalised trophies which are also branded with the club logo. If you would like to introduce this service at your club we will set the whole process up for free and you will start to earn a commission for every trophy ordered.